At UChic we work hard. But we have a whole lot of fun doing it. Especially when that good time can help fund awesome young women! Next week in our hometown of Kansas City, join us for a night of fun and philanthropy while enjoying complimentary food and drink on March 10, at HMK on the Country Club Plaza. Don’t live in KC but would like to host your own 1,000 Dreams Party? Email us at staff@uchic.com for tips on how to host your own gathering to benefit our 1,000 Dream Fund! We have partnered with The Women’s Foundation of Kansas City, so you can mingle with other female leaders, dreamers, movers and shakers. Or you can help fund a dream and be rewarded for it! 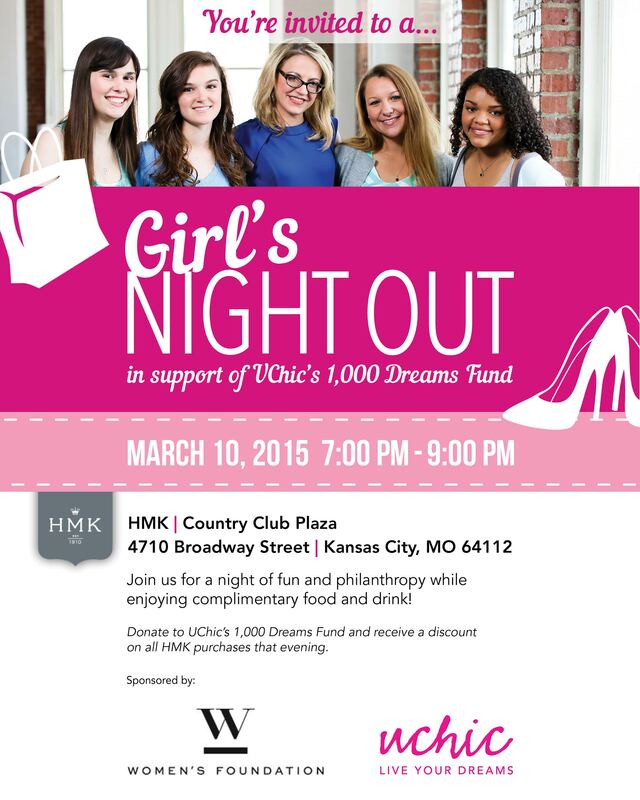 Donate to UChic’s 1000 Dreams Scholarship Fund that evening and receive a discount on all HMK purchases! If you have any questions about the event reach out to us at staff@uchic.com. Thanks and see you all soon!